The Garibaldi Damselfish is big and bold, in both its rich orange color and its attitude! The Garibaldi Damselfish Hypsypops rubicundus is a bright, bold fish. As a juvenile the Garibaldi is one of the most attractive damselfish. It's bright orange as an adult, but the young are a more reddish orange. The orange is contrasted with numerous blue spots and dots scattered across the body and fins, and their fins are edged in blue. This beauty immediately stands out with its strong orange color and it has an outgoing attitude to match. This damsel is often described as being quite "cheeky" by scuba divers as it shows no fear and comes right up to look you in the eye. It is a rether large damselfish, reaching up to 15 inches (38 cm) in length. With the exception of the Giant Damselfish Microspathodon Dorsalis, this damselfish is one of the largest of the group. The Garibaldi is very hardy, which makes it easily kept in community fish tanks or reefs, but it is quite a bit larger than those regularly seen in the aquarium hobby. Juveniles will be available on rare occasions, but young specimens are generally less than .65 inches (200 mm) long. They are the California official marine state fish and it is illegal to collect them or keep them in California without a permit. These fish are reef safe and can also be kept in a fish only aquarium. As juveniles they are very easy to keep in the aquarium without special care. But as an adult, their large size and aggressive, territorial nature creates more of a challenge. They are extremely aggressive towards their own kind and only one of this species should be kept in the same aquarium. As this damselfish matures only other large and equally pugnacious fish can safely be kept with it. They need a large aquarium. A minimum sized tank of 100 gallons will work if keeping only one Garibaldi. As they grow into adulthood they become highly territorial and very aggressive. If keeping them with other fish an even larger sized tank will be needed. Provide plenty of live rock so there will be territories for each fish and lots of places for shelter and hiding. Garibaldi - A Cheeky Fish! The Garibaldi Damselfish is found in coastal waters of the Eastern Central Pacific Ocean where the water is cooler than tropical locations. We have see this fish in the kelp forests off the California coast in conjunction with the cooler water Catalina Goby, named for an island off the California coast. They are known to divers as 'cheeky fish' since they are curious and unafraid of divers. The Garibaldi is one of the largest fish in the damselfish family, it is a striking orange color, and as a juvenile, is marked with many blue spots. The fins of the juvenile are also outlined in blue adding to its beauty. The Garibaldi Damselfish is a very long-lived fish, it can live up to 25 years. This damselfish should be housed in an aquarium of at least 100 gallons with plenty of live rock to accomodate their territorial nature. They are extremely aggressive towards their own kind, and only one Garibaldi should be kept in a single aquarium. The diet should include various meaty foods, herbivore preparations, and flaked foods. The Garibaldi is sexually dimorphic; the male is larger than the female and also has a lobe on the front of the head. These fish have not been successfully bred in captivity. The Garibaldi Hypsypops rubicundus is also known as the Garibaldi Damselfish. It is from the Pomacentridae family, and was first described by Girard in 1854. The Hypsypops genus was described by Gill in 1861 and contains only this single species. This species is often erroneously misspelled as Hypsypops rubicunda. They are found in the Eastern Pacific Ocean from northern California to the tip of Baja and in the southwestern Gulf of California, including Guadeloupe and Rocas Alijos. Their occurrence is rare north of California. The common name of "Garibaldi" is in reference to Giuseppe Garibaldi, an Italian general, politician and patriot who often wore a red shirt as his trademark. These fish are listed on the IUCN Red List as Least Concern (LC) as they are widespread in the Eastern Pacific Ocean with no major widespread threats. They are fully protected in California coastal waters and are the California official marine state fish. It's illegal in California to collect them or keep them without a permit. They may be protected in marine reserves of the United States and Mexico as well. The Garibaldi In general are solitary fish. They do not school but they can occur in loose aggregation at depths down to 98 feet (30 m). In their natural habitat they are found at inshore rocky reefs or in giant kelp beds. They swim in the kelp forests as well as along rocky bottom areas, often near cracks and crevices, where the water is clear. Adults maintain a home territory and males will fiercely defend the eggs of a sheltered nest until they hatch. Divers often observe adults chasing away all intruders. These fish feed mainly on invertebrates such as tubeworms, nudibranchs and bryozoans, but also consume sponges and algae that grow among the rocky substrates. It is suggested that the sponge diet may contribute to their bright colors. Social Grouping: Solitary - Primarily solitary, but occasionally in loose aggregations. The Garibaldi is a bulky deep bodied fish. It is an extra large damsel fish that can reach nearly 15 inches (38 cm) in length and weigh around 2 pounds in nature. In the aquarium they will generally reach about 12 inches (30). These are extremely long lived fish, and can have a life span of up to 25 years. The body and fins of the adult are entirely bright orange. Very young specimens are reddish orange with numerous blue spots scattered mainly on the upper side. They have orange fins with a blue edge and blue dots on the dorsal and caudal fins. Juveniles are similar to very young fish, but with fewer and larger spots on the upper side and fins. Adolescents will also have a faint blackish spot on the middle of the dorsal fin and blue lines on the head, just above eye. Size of fish - inches: 15.0 inches (38.10 cm) - They can reach up to 15 inches (38 cm) in nature, though are usually around 12 inches (30) in the aquarium. Lifespan: 25 years - Usually have a lifespan of 17 to 25 years in the captivity. The Garibaldi Damselfish is very durable, but grows quite large. Like many of the damsels, as they grow they also become highly aggressive. A juvenile is very easily kept in the home aquarium without special care. But as an adult, its large size and territorial nature creates more of a challenge. Due to the tank size needed for their size and territorial nature, they are suggested for an intermediate aquarist. A single adult needs to be kept in a large aquarium of 100 gallons minimum. If kept with other fish the tank will need to be larger. This fish does not need anything special beyond some rock work, a variety of foods, and the typical equipment you would find in a marine tank. Even though they are quite durable, they still can fall ill if exposed to poor water conditions for too long. Doing normal water changes, feeding them a variety of foods several times a day, and having proper tank mates are necessary to keep this damselfish. Aquarist Experience Level: Intermediate - Suggested for an Intermediate to advanced aquarist due to the tank size needed and their aggression level as adults. Garibaldi Damselfish are omnivores. In the wild they eat small animals such as tubeworms, nudibranchs and bryozoans, as well as sponges and algae, but they do not harm any live corals. No special food is needed in the aquarium and they will accept a wide variety of foods. Provide meaty foods and herbivore preparations, dried flakes, shrimps, and occasionally tablets. It is best to feed small amounts of food at least twice a day. Feeding them more often helps to dissipate any possible aggression within a tank. If feeding pellets, make sure they are wet before adding them to the tank so air will not get into their digestive tract, which can cause issues. Feeding Frequency: Several feedings per day - Feed at least twice a day. 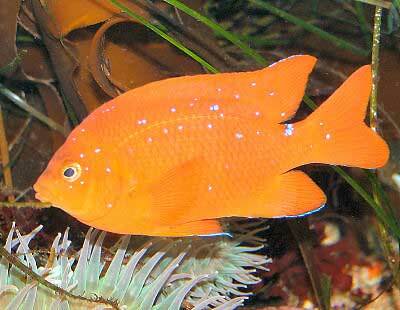 Garibaldi are very hardy fish and will thrive in a well maintained aquarium. No special care or technique is needed to maintain this fish in the aquarium and it will become a hardy pet. It is usually a very active swimmer and it will venture to the surface for foods when well acclimated. Frequent water changes are not necessary, rather normal water changes at 10% biweekly or 20% monthly are fine for a fish only tank. If kept in a large reef tank of 100 gallons or more, with water that is aged and stable, do partial water changes of 20% to 30% every 6 weeks depending on bioload. Water Changes: Bi-weekly - Bi-weekly Water changes of 10% biweekly or 20% a month in a fish only tank.. The Garibaldi Damselfish is a large active fish. It is best kept singly or with equally belligerent tankmates that can hold their own. In a fish only tank it needs an aquarium of at least 100 gallons (378 liters), because if the tank is too small adults may collide with the glass. A larger tank will be needed if keeping it with other fish. It can be kept in a reef tank as well, but keep in mind that it may harm live soft corals and possibly be a threat to small decorative shrimp. It is most active during the daytime and less so at night, and will hang out across the entire tank.The tank needs to have plenty of open space for swimming. It should be well decorated with rocks and corals, creating a stable cave or sheltering ledge. Additionally rocks arranged with plenty of hiding places are especially important for juveniles. Provide good filtration with at least a slow circulation in the tank. This fish needs cooler water than many marine species. Water temperatures between 68˚F to 79˚F (20 - 26˚C) with a pH of 8.0 to 8.4 will keep them happy and healthy. Minimum Tank Size: 100 gal (379 L) - A larger tank will be needed if keeping them with other large saltwater fish. Live Rock Requirement: Typical Plus Hiding Places - Hiding places are needed to help the Garibaldi juveniles feel secure. Lighting Needs: Moderate - normal lighting - It is best kept under normal lighting, but can also be kept in sunlit conditions. Water Movement: Any - Water movement is not a significant factor, and it can tolerate a stronger flow. The Garibaldi does well in a fish only tank, but aquarists need to select the tank mates carefully. In general it is a solitary fish that does not school. As an adult it is aggressive, territorial, and is intolerant of its own kind. Never introduce more than one specimen of this damselfish in the same tank. Small or non-aggressive fish species are not recommended tank mates even when the damsel is young. Both younger specimens and adults will be very aggressive towards them. Large specimens of Pomacanthus or Holacanthus angelfishes, sharks and rays, some wrasses, parrotfish, and sea basses might be kept with them if they can tolerate the cooler water. This damsel is considered reef safe but may harm live soft corals or small invertebrates. Adults may also attack ornamental shrimps. Same species - conspecifics: No - They are intolerant of their own kind, best to keep only a single specimen or pair. Soft Corals (xenias, tree corals): Monitor - May nip at them. Sponges, Tunicates: Threat - A natural food for them in the wild. Shrimps, Crabs, Snails: Threat - May be a threat to small decorative shrimp. The male will be larger and develop a lobe on the front of the head. There has been no record of successful breeding of the Garibaldi in captivity. In the wild the adult male maintains a home territory. The male clears a sheltered nest site where the female will deposit eggs. Once the eggs are laid the male will quickly fertilize them and aggressively defend the eggs from any intruders until they hatch in about 19 to 21 days. The male is extremely protective of the area where the eggs are deposited and will attack and drive away any intruders, including larger fish and even humans. For more information on the breeding of damselfish, see Marine Fish Breeding: Damselfish. Garibaldi Damselfish are very durable and hardy fish. Yet they are prone to any disease that captive saltwater environments have to offer. They are most likely to be affected if they are stressed from inappropriate housing or tank mates. As with most damselfish, they are susceptible to Marine Ich Cryptocaryon irritans, also called White Spot Disease or Crypt, Marine Velvet or Velvet Disease Oodinium ocellatum (Syns: Amyloodinium ocellatum, Branchiophilus maris), and Uronema disease Uronema marinum. All of these are parasites. The most easily cured of these is Crypt (salt water Ich), but they are all treatable if caught in a timely manner. Marine Velvet is a parasitic skin flagellate and is one of the most common maladies experienced in the marine aquarium. It is fast moving and primarily infects the gills. Uronema disease, which is typically a secondary infection, is very deadly and will attack your damselfish quickly and lethally. The first symptom is lack of appetite. It is most often contracted when the aquarist lowers their salinity to treat another type of illness, but doesn't lower it far enough. This parasite thrives in mid-level brackish water salinity, which is a specific gravity of around 1.013 to 1.020. The Garibaldi Damselfish will only rarely be sold at retailers and can be quite expensive. They are occasionally available online. Most specimens available will be shipped from Mexico, perhaps with limited permission. It is illegal in California to collect or even keep this species without a permit.